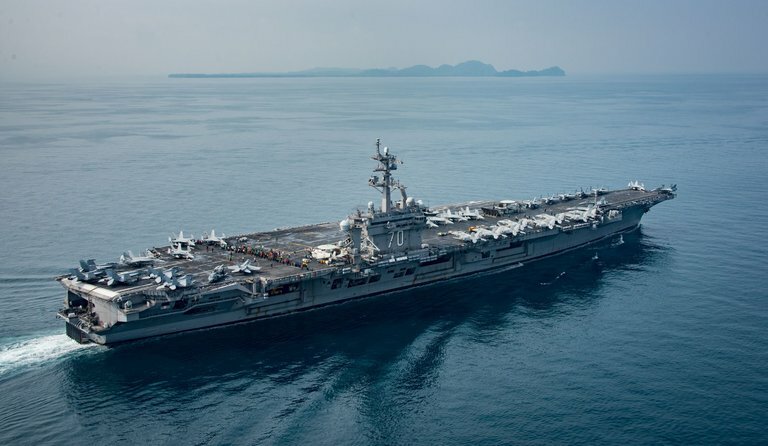 The Trump Administration spurred a crisis with North Korea with the mistaken declaration that a US aircraft group was en route to waters off the Korean Peninsula. Last week, the White House said the USS Carl Vinson and three other warships were sending a powerful signal with their deployment. “We’re sending an armada,” Donald Trump told Fox News. But the carrier group was actually heading in the other direction for joint exercises with the Australian Navy in the Indian Ocean, 3,500 miles from North Korea. The story came to light on Monday when the Navy unwittingly showed the Carl Vinson moving south through the Sunda Strait (pictured) between the Indonesian islands of Java and Sumatra. The picture was taken last Saturday, four days after White House spokesman Sean Spicer said the carrier was in the Sea of Japan and closing on the Korean Peninsula. The White House blamed the Defense Department for the error, while Pentagon officials described a series of mistakes and a misleading announcement by Defense Secretary James Mattis. Trump’s exhortations about the “armada” then made a pullback more difficult, the Pentagon said. The carrier group is now on course for the Korean Peninsula and should arrive there next week. Donald Trump warns Canada that he will act over what he claims are protectionist trade practices affecting US dairy farmers. Trump repeated his threat to eliminate the North American Free Trade Agreement with Canada and Mexico if it cannot be changed. Canada’s dairy farmers agreed last year to sell milk ingredients used for cheese-making to Canadian processors, which include Saputo Inc and Parmalat Canada Inc at prices competitive with international rates. The pricing agreement was a response to growing US exports of milk proteins that are not subject to Canada’s high tariffs. Canada’s Ambassador to the US sent a letter to the governors of New York and Wisconsin, saying the American problems stem from overproduction rather than Canadian policy. Federal agents have deported the first “DREAMer” immigrant under the Trump Administration’s crackdown. Juan Manuel Montes, 23, who has lived in the U.S. since age 9, was spending an evening with his girlfriend in Calexico, California, on February 17 when he was questioned by a US Customs and Border Protection officer. Montes had left his wallet in his friend’s car, so he could not produce his ID or proof of his protected status under the Deferred Action for Childhood Arrivals program. Within three hours, he was back in Mexico. Montes was twice granted deportation protections under DACA, created by President Obama and left intact by Donald Trump. However, at least 10 are DACA enrollees are in federal custody.